It has been said that trends are a measure of our times, and the roller-coaster ride of 2004 seems to have produced a strong reaction in fashion for the home. At Canada's Home Furnishings Market, Pierre D'Anjou and Andre Caron were moved to chose “a different out-of-this-world experience” for their sixth edition of the much anticipated Trends Display. Fourteen thousand Canadian and international buyers were the first to confront and applaud their vision at Toronto's International Centre. Think town square Europe, a space with “clear boundaries, yet a sense of openness”. More than a series of room settings, the area was a habitat. Visitors entered a three-sided enclosure of freestanding 10' x 10' modules and, with their companions, lived the designers' intent, sharing reactions to each staged lifestyle mood. The vignettes, created for the here and now, were guaranteed to free the imaginative process and inspire in-store displays and windows in home furnishings outlets across the country. “It's an important part of our marketing mix”, said a retailer from the prairie provinces, close to the U.S. border. “We use all the usual attention-getters, regular print advertising in local papers and design magazines, radio spots for sales and, very important, direct mail to our preferred customer lists for introductions and events. 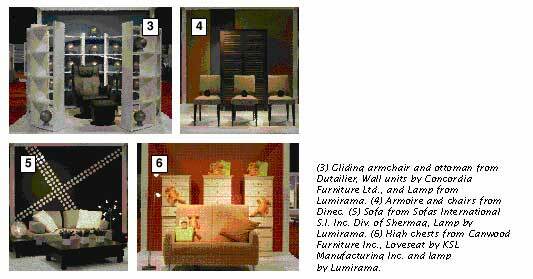 But once the potential customer is in our store, seeing our product lines well displayed will pique their design instincts. They'll be able to 'place' the furniture in their home environment. Additional sales for us,” he smiled. Perched on Italdivani's scarlet faux suede ottoman at the front of the very first space, was a rounded sky blue figure, lit from within, wearing a quizzical “where-am-I-and-do-I-like-it” expression. Perhaps a clue to his identity was the space traveller furtively watching the scene from the safety of the Visu wall unit top. Our Alien, for such he must have been, triggered many whimsical touches throughout Trends 2005, colour, shape and, most certainly, soaring flights of fancy! The wall unit is intended to present a flat screen television but, for the Market, Pierre and Andre substituted a mirror to “announce” the Display. “It's the first thing you see as you enter Hall Five and approach the area,” said Pierre. Hemsley is responsible for lighting. 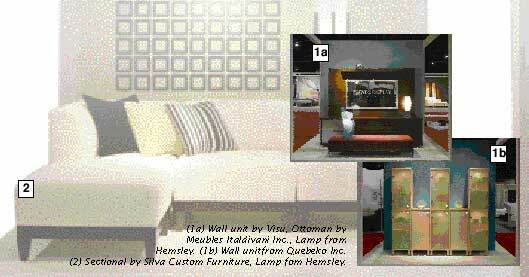 The trio of Quebeko wall units was handsome habitat for gold fish both inside and outside the cabinets. Accessories, green Chinese food boxes. You choose your own objets! Both of the first settings were small, enclosed in one 10' x 10' space. Then there was a more oblique approach to the solar system with 3D “Os” applied to a chlorophyll green wall. The Silva sectional sofa in creamy gold white was supported by classic dark wood framing and legs. Three chairs all in a row, each with its own spherical brown vase strapped safety-belt style to the seats, looked ready for take-off! A slatted armoire lined with fabric provided storage or room for entertainment gear, and a backdrop blue curtain defined the Mondrian-like appeal of the tableaux. Sofas International contributed a fun, gray sliding seating unit for our Alien to play with, complete with tables that can be used anywhere one's fancy dictates. And behind the sofa the charcoal wall was bisected by applied vinyl circles, more constellations in action, echoed by the softly glowing globe and solar system Lumirama lamp in the corner. More geometrics in the squared vases on the tabletop, filled with two tone gray foam insulation. Five, count them, bright orange Teddy bears occupied the next setting, ready for shopping with their green plastic bags. Canwood's natural wood units provided good climbing. The loveseat, also orange, was by KSL, clad in soft microfibre, boasting a very comfortable high back, a perfect headrest for bears, Aliens or us. A Lumirama standing lamp. The very sophisticated Mobican bedroom was a symphony in silvery blue from linens to the delicate hanging lamp. Its small, metal silver-frosted leaves inspired the dynamic wall motif, fabric with metallic silver paper overlay. The treatment of Mobican's bed and table is “latte”, a bleached oak that appears to have been rubbed with milk. Decorative wine bottles were blue. The seven foot tall knife, fork and spoon that provided wall interest in this setting told you it was all about dining, with Amisco at its heart and soul. The high pub table and stools were silver highlighted, as were the fantasy utensils. Table décor was a tall vase filled with white plastic balls (planets?) and interestingly shaped bottles on either side. Walk around the module and you would have found three perky stools, one red, one orange and one blue, all from Trica. And they were backed by three more of those spherical things, each one containing a different colourful vegetable. Rubber, Pierre told me. An interesting corner for anyone's living room contained a low creamy beige sofa by Colexion Perez and, defining the space, three tall neon lights were set against orange doors mounted on deep chocolate brown. The tables, also by Colexion, supported three vases in brown, red and orange. Pierre's absolute favourite module reflected his sentimental side, a return to the past, full of memories, but still twenty-first century modern. Colours were warm, three convertible ottomans in intense orange by Lucy Au with a cuddly white fur throw, a tri-stemmed Hemsley lamp with a glowing shade and, the piéce de rèsistance, above the hanging electric stainless steel Dimplex fireplace, a reindeer head by Te-Ri. Clean lines, warmth, a chalet to dream about. Dutailier pleased any little girl with feminine but practical bed and chests and the designers found linens by Jonatex to complement and soften the classic white furniture. 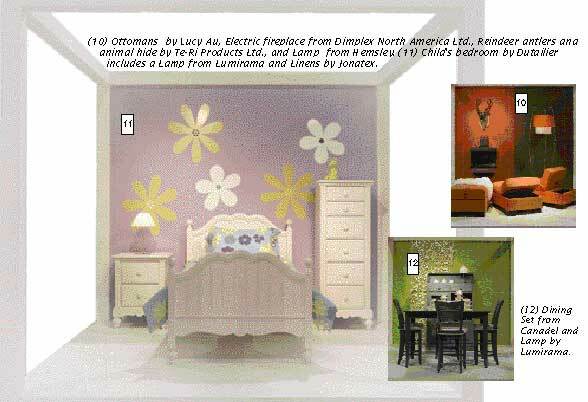 Daisies were magnified on the lilac wall in blue, mauve, green and yellow, the lamp by Lumirama. An interesting vertical three-dimensional panel of white cutout flowers, birds and leaves was a touch of springtime against the Eden's Garden green wall. It was an unusual backdrop for the turquoise Canadel dining table, china cabinet and chairs. 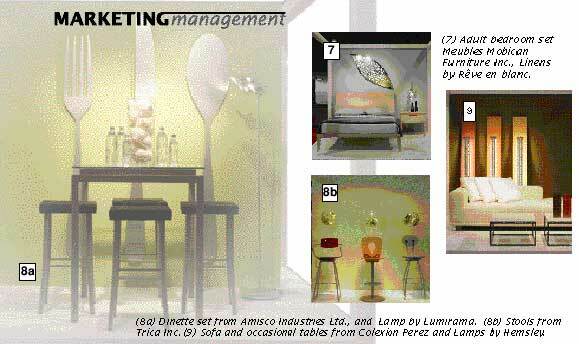 Stacks of pure white cups and saucers and the white Lumirama lamp sparked the upbeat look. 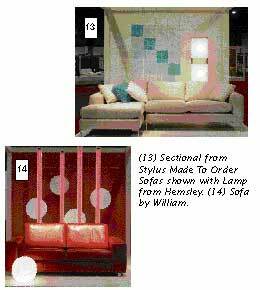 A very low Stylus Made to Order beige sectional sofa floated against turquoise squares, plexiglas patterned, the geometrics creating a shadowy wall repeat pattern. The Hemsley lamp provided asymmetric balance. The Alien returned with a lively William red leather loveseat. Smooth as can be, with no visible stitching, one can imagine it anywhere in the galaxy. Note the four globes behind the red plastic wrapped neon lighting, and the white-lighted sphere in the foreground. The town square was made comfortable for visitors by Romano. Sectional sofas in turquoise circled the heart of the action, a great vantage point for people to look, discuss, analyze and have fun. 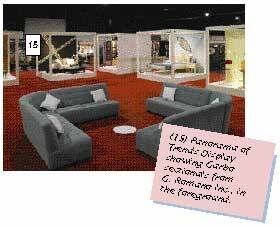 “The night of the opening of Trends Display 2005 was crowded with people. It was wonderful! As I said, more visitors than ever before. I believe we set the tone of the Market. Pierre and Andre derived much of their inspiration from the High Point and Milan Markets last year and then developed their ideas with intensive research and discussion. Pierre will be working this year for the Home Show in Montreal as well as the Design and Gift Shows. And later this year the two designers will lecture to retailers on the topic of … guess what? creating in-store presentations. We'll persuade them to share their wisdom with us. And, in case you're concerned, they believe the Alien returned safely to his own star, sun, moon or planet. He was seen carrying a tote bag filled with fabric samples and paint chips!